Health care practices have changed dramatically over the past 10 years. Where previously most cancers were diagnosed and treated in an acute care facility many cancers are being diagnosed and treated exclusively in physician office settings. To assure completeness in cancer surveillance we rely on physician reporting of these cancers. Data you provide are essential for accurately assessing the cancer burden within our state. We have streamlined the data elements we ask you to complete to those that are the most important for surveillance, public health policy development, and research. As we assess the cancer burden, not only do we need to identify all cancer cases, we need to have complete and accurate information. Race is one data item that is extremely important to have as complete and accurate as possible, since there are distinct differences in cancer morbidity and mortality seen in different racial groups. As seen by the graphs below, race is important and without your data, underserved populations in our area are not accurately represented. Rates are per 100,000 and age-adjusted to the 2000 US Standard Population (19 age groups – Census P25-1130). Non-Hispanic blacks had the highest incidence of prostate cancer among all race groups (97.1 per 100,000) in CRGC regions during 2003-2012. 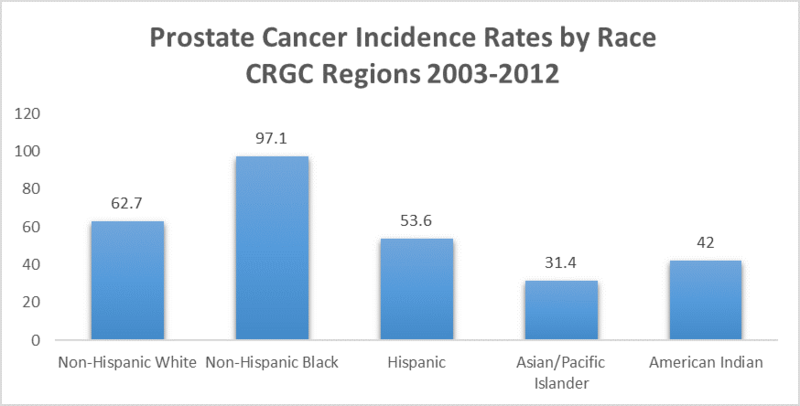 Asian/Pacific Islanders had the lowest incidence of prostate cancer among all race groups (31.4 per 100,000) in CRGC regions during 2003-2012. American Indians had the highest incidence of liver cancer among all race groups (14.6 per 100,000) in CRGC regions during 2003-2012. We know, however, that many American Indians with cancer are incorrectly reported as Hispanic or some other race, which results in the incidence rates for American Indians being lower than they actually are in California. Non-Hispanic whites had the lowest incidence of liver cancer among all race groups (5.5 per 100,000) in CRGC regions during 2003-2012. We are working with the state to make cancer reporting more efficient and less time-consuming for you through electronic reporting. Further details will be forthcoming soon. In the interim, we appreciate your efforts to provide complete and accurate cancer data. Thank you for completing this Cancer Reporting Form.